In recent year, pro-gay and anti-gay rights activists have engaged in a struggle to sway public opinion in their favor through the use of ideologically charged rhetoric in an effort to win support from an undecided public. The author contends, however, that the debate is stalemated precisely because each side stereotypes and pathologizes the other's perspective, thereby becoming perfect enemies divided on every issue and with such intensity that consensus seems nearly impossible. Providing a panoramic view of both perspectives, this unique book traces the contested issues to fundamental conceptual differences within the field of religious, scientific, and political studies. 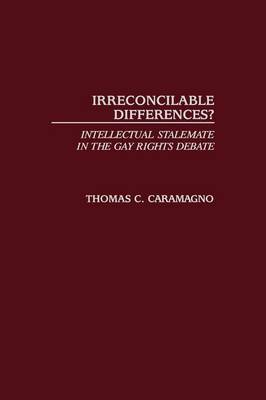 Caramagno carefully examines the centuries of thought behind the questions involved and encourages readers to consider the arguments in order to draw their own conclusions. This book is not about the wrongs or rights of the gay-rights debate. Nor is it a condemnation of the sides involved in the debate. Instead, it shows how the two sides have engaged in the battle and how they have marshaled evidence from a variety of sources (often the same ones) to muster public support but without addressing the conceptual changes needed to conduct a more profitable dialog. Treating both sides of the debate respectfully and objectively, Irreconcilable Differences? opens the discussion up so that all ideas and arguments can be understood as having something valuable to bring to the table. In this way, readers are challenged to consider the ways arguments are formed, how culture disseminates ideas, and how a debate can be shaped so that consensus-building is a real, not an imagined, outcome.